Amazon.com Price: $15.91 (as of 2019-04-22 02:41:05 GMT) Product prices and availability are accurate as of the date/time indicated and are subject to change. Any price and availability information displayed on Amazon.com at the time of purchase will apply to the purchase of this product. 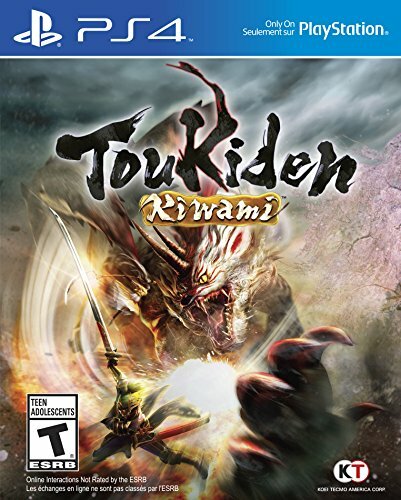 Developer Omega Force, creators of the renowned DYNASTY WARRIORS series, set forth to make Kiwami the preeminent Toukiden experience offering updates and vast improvements to popular features requested by fans. More than just an expansion Toukiden: Kiwami offers all of the content in The Age of Demons, an extensive character creation mode, and numerous additions enriching the experience through new story and game content, including 300 characters whose souls help strengthen their team and defeat enemies. Set against a backdrop inspired by various historical periods of Japan, Toukiden: Kiwami continues the tale of humanity’s last stand for survival. For its debut on the PlayStation 4, Kiwami picks up the story from the beginning, introducing new players to its vast, demon-ridden world. Almost double the size of the original game, new and returning slayers will continue their mission when Age of Demons ends and discover all that Kiwami has to offer. Toukiden: Kiwami will also include an extensive multiplayer mode. Players are always encouraged to attack the most powerful Oni and, will again have the choice between various NPCs or ideally, a cooperative multiplayer mode that allows for a team of up to four Slayers to and banish a demon together.